Certain days hold greater significance than others. 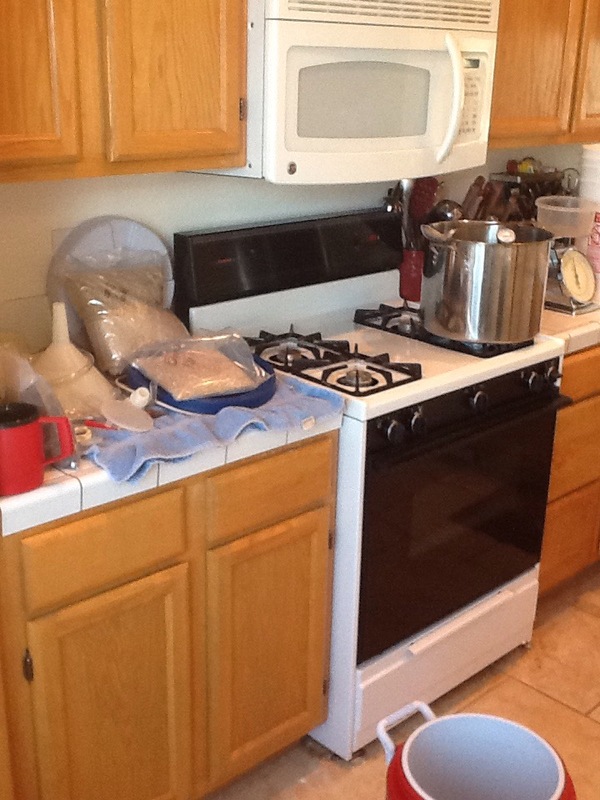 We either commemorate them because of the memories they engender, like an anniversary, or we anticipate them because of the memories we expect to create, like a brew day. The years between my brew days have been long. But I was determined to have one again and to relish it despite any mishaps. The yeast starters performed admirably despite my trepidation and unseasoned hand. This infused hope into my brewing soul; it vaguely mollified my apprehension. I brought forth all the old equipment and wiped away the dust. With soap and water I scrubbed away old smells and accumulated dirt. There was not much but they needed cleaning. Cobwebs and broken glass and cracked tubing and bits of long dead bugs … yes, the cleaning needed to be done. In the old days I had become accustomed to scalding water. I learned quickly that I would need to be acclimated once again. A more important step,even than grime removal is that of sanitizing. It is in this arena that I know I had failed in the past. My resolve was to unfail this time around. I had a bottle of iodophor and kept it out and accessible. 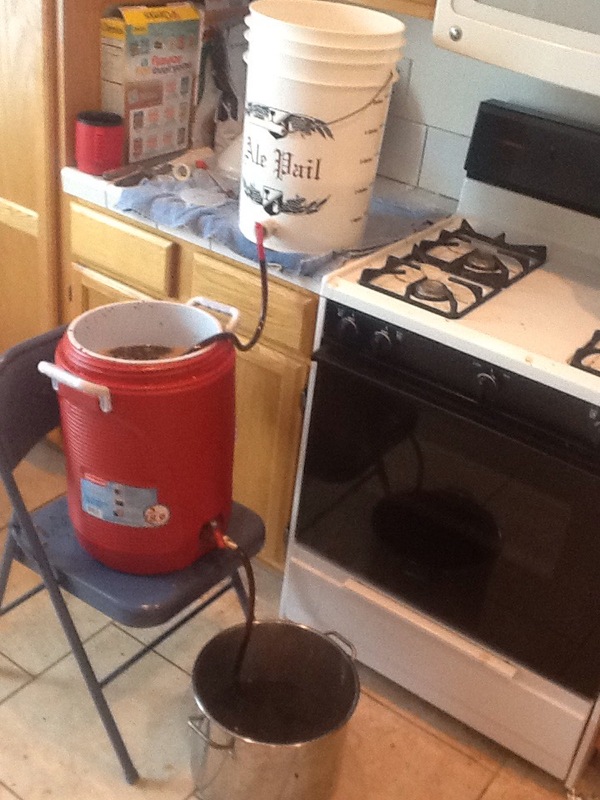 The first to get sanitized was the brew kettle so that I could heat my mash water (360 ounces at 169 degrees). Then the mash tun and hoses got the iodophor treatment. And my large mash spoon. I kept either a bucket or a bowl of sanitizer solution close at hand throughout the day. Additionally, I’d even carefully read the directions on the bottle of iodophor paying special attention to the mixing ratio. Once the water was at temp I poured it into my newly made mash tun. Then I added the grains (mashed in). 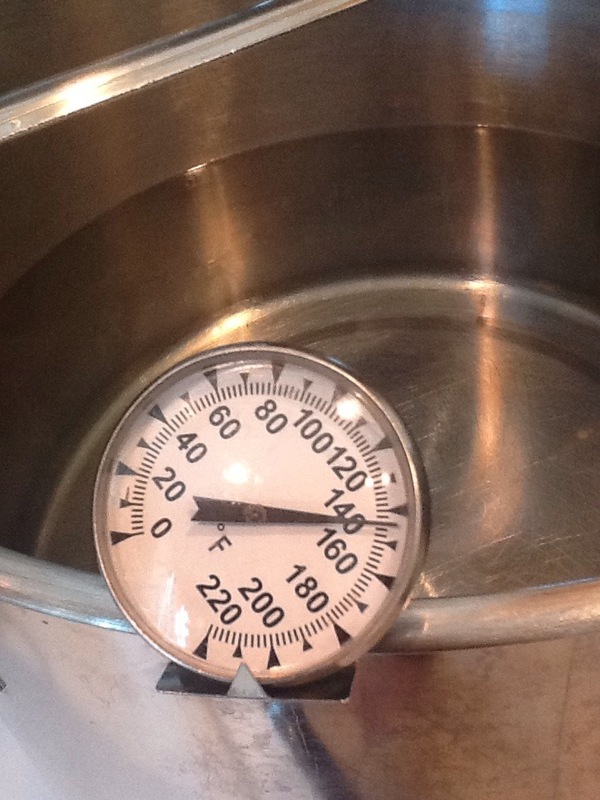 The temperature of the mash settled at about 152-153 degrees which was slightly lower than desired. Of course, as I’ve read, all that’s needed to remedy a low mash temperature (if you’re using a beverage cooler mash tun, that is, and not one that is heated directly) is to heat up a quart of water and add it to the mash. I did this. 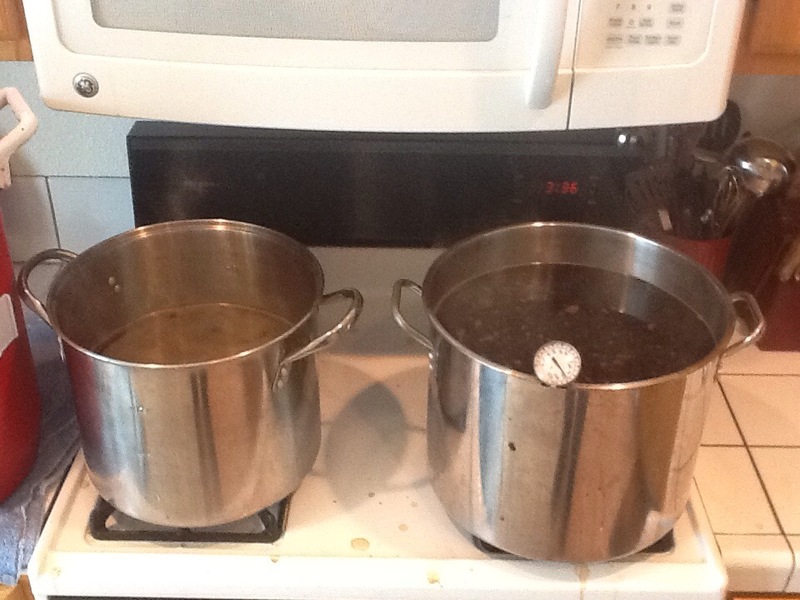 Then I proceeded to gather my sparge water and get it heating while the mash proceeded. Even when brewing regularly I did few all grain batches. I learned very quickly that I was much out of practice. 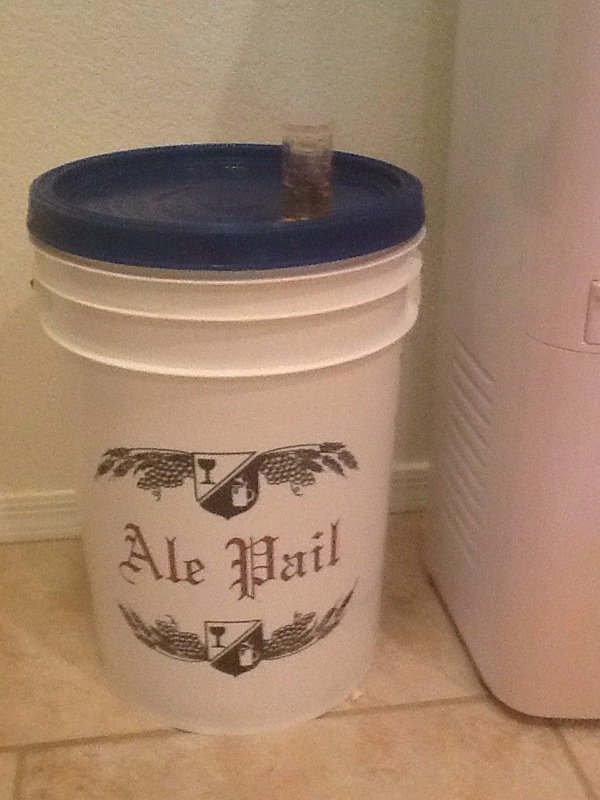 When calculating sparge water I did not properly account for mash water absorption or volume. 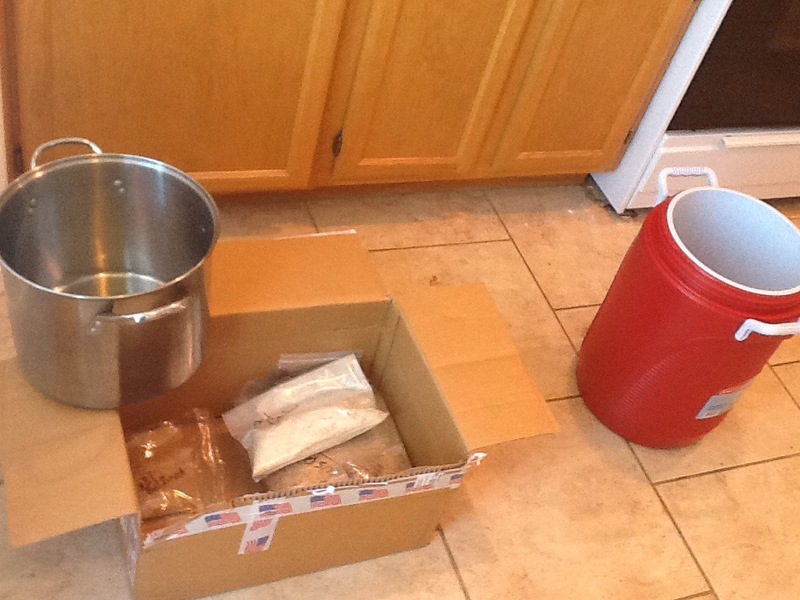 I was aiming for a two-and-a-half to three gallon overall batch. 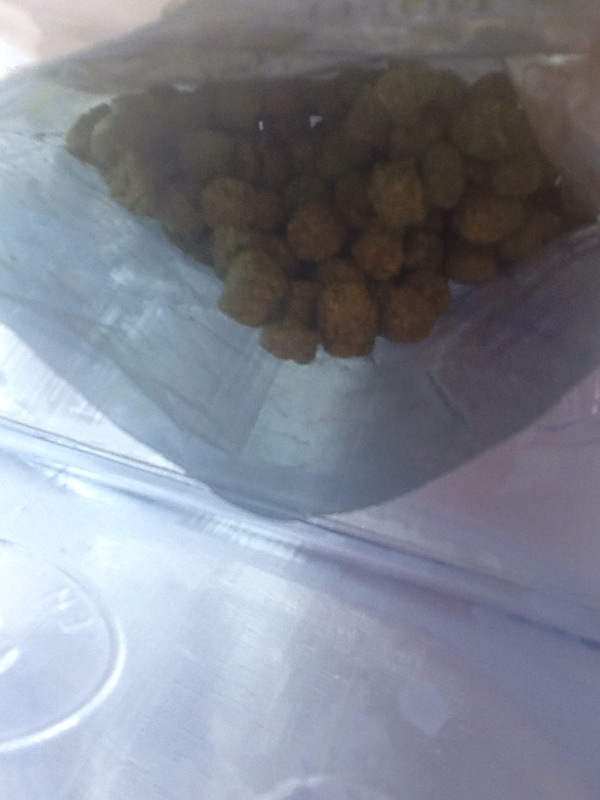 I ended up with approximately four-and-a-quarter. This, of course, affected my beginning gravity. It came in at 1.042, far less than I anticipated. That’s okay, though. I’m not even upset. I enjoyed the whole dang thing. After sixty minutes the mash was complete. I drained the mash water and recirculated it. In other words I drained the water from the grain bed into one of my kettles. It looked and smelled fabulous, like burned coffee and toast. 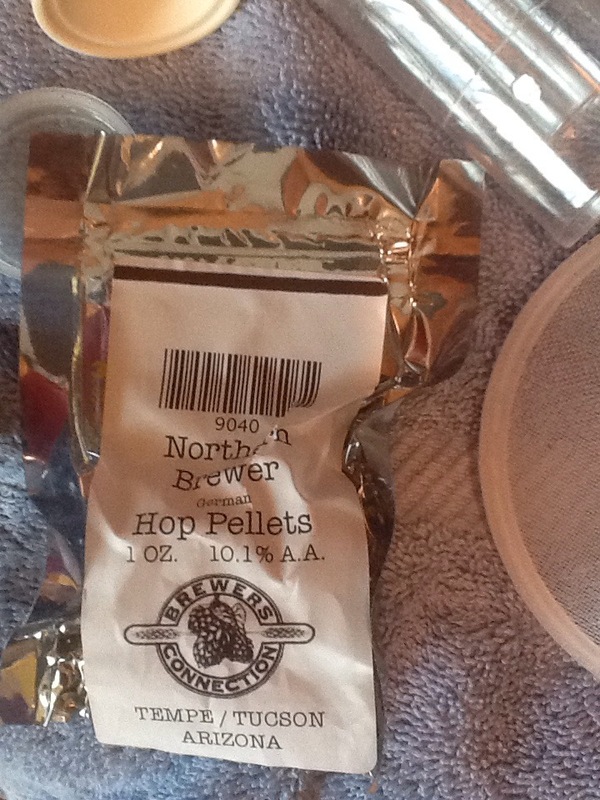 I poured this back into the mash tun. I put another kettle down and started slowly rinsing the grains. 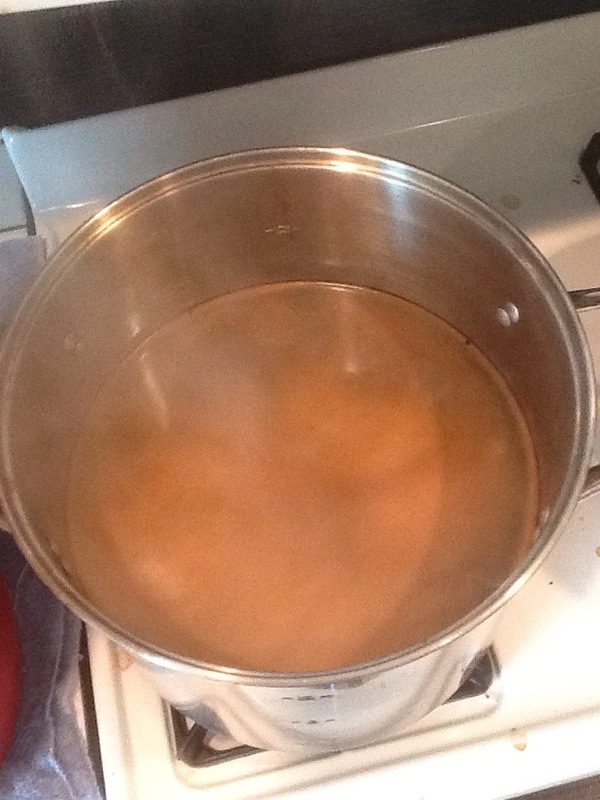 I recirculated the initial mash volume a second time and rinsed with three gallons of hot water, 170 degrees. I think the sparge water should have been around 190 to raise the mash to 170. That affected the gravity reading, too. That’s okay, though. I’m not even upset. I enjoyed the whole dang thing. 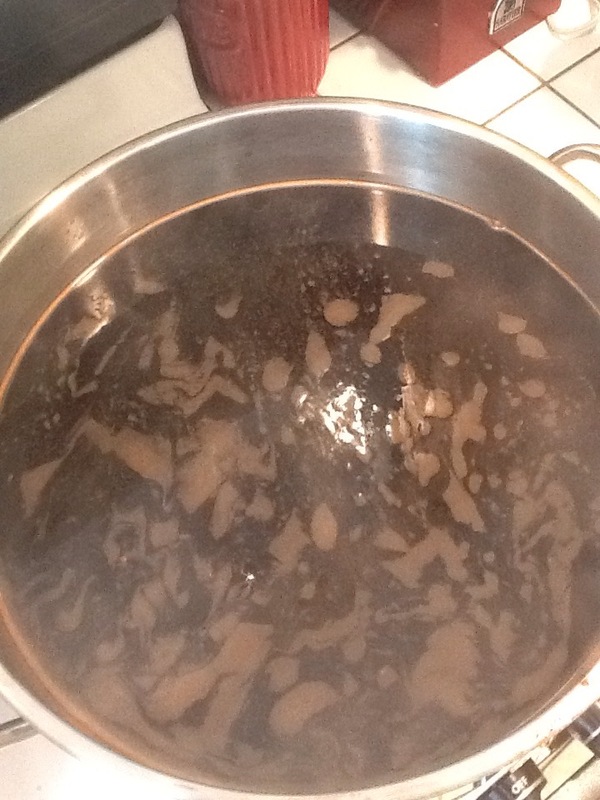 Well, once all that was done and I had collected all my extra wort into two kettles the boil began. This part went as planned. There’s little room for error when heating liquid. 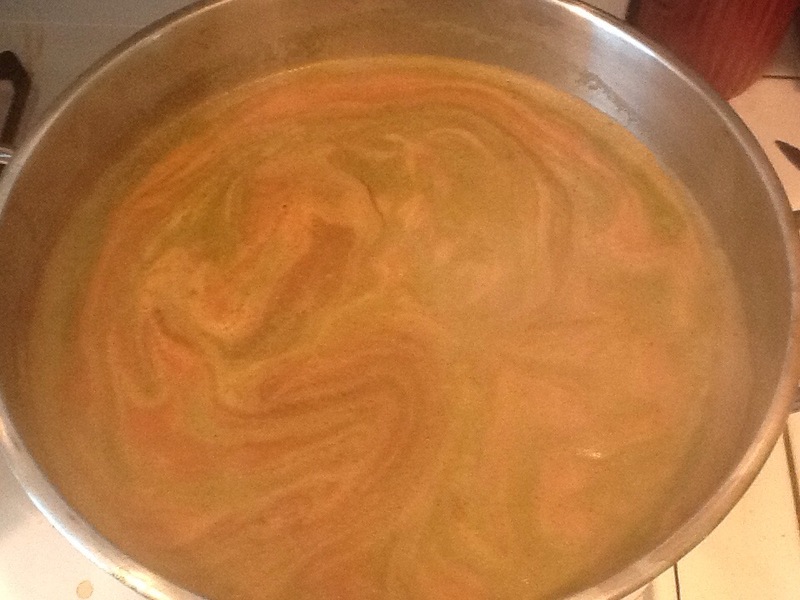 The hops went in as the boil began producing a kaleidoscopic swirl of green and brown. Generally the confluence of those two colors portends infectious things. But in this instance it was pleasing. The boil ended. The true challenge now begins. 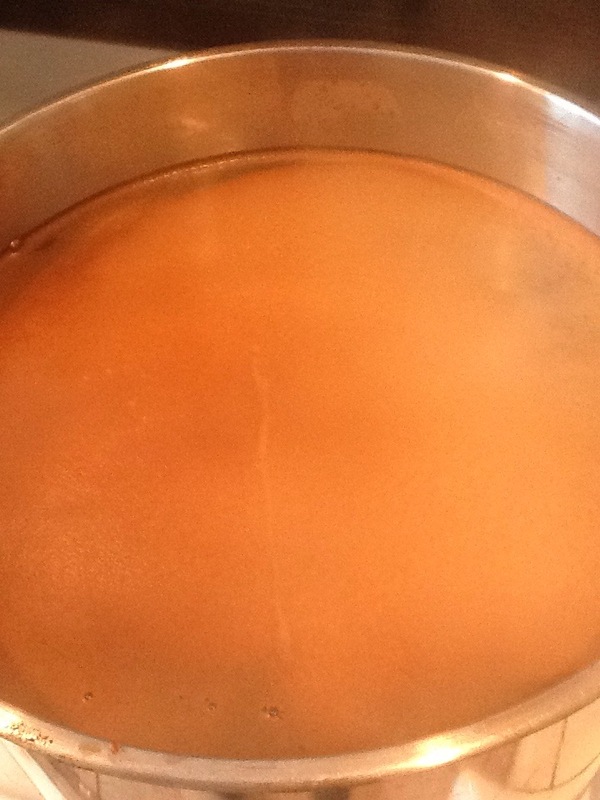 The Chilling of the Wort. I have no chiller so it’s all ice baths for me. On the day of the brewing an amazing thing happened in the desert. It had snowed. And the snow remained. For days. Thus in our backyard there was at least six inches of snow. 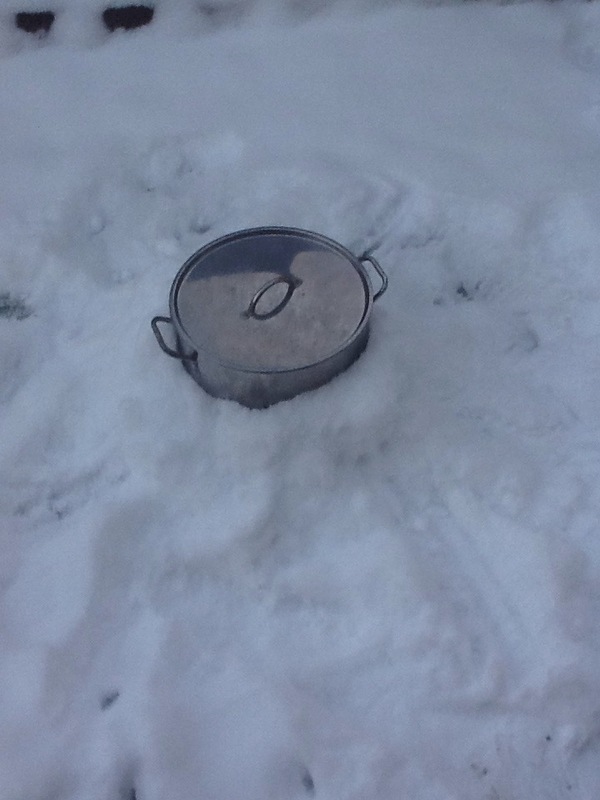 So, the kettle went outside. Even sitting in the snow and being transferred between kettle and sanitized fermenting bucket several times did not cool it quickly, however. Honestly it must have taken three hours. My next investment is going to be a plate chiller. 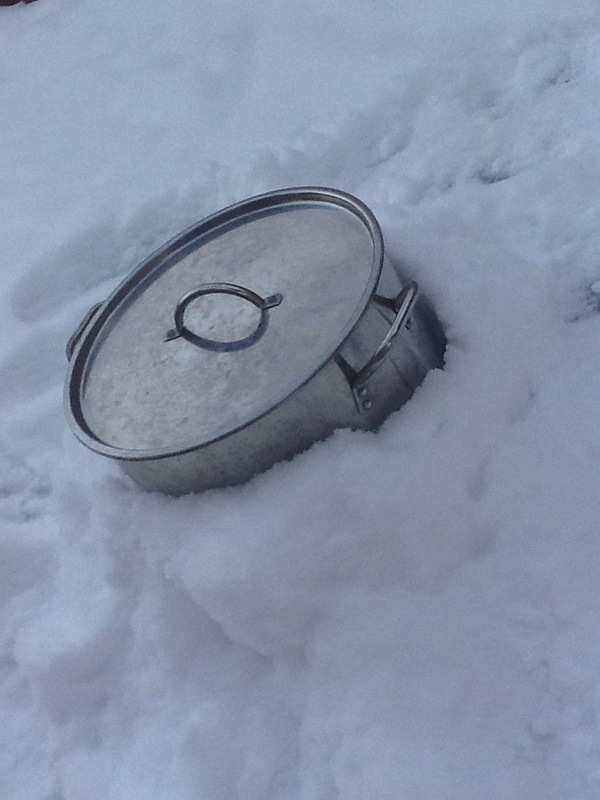 Once it finally reached pitching temperature – seventy degrees – I poured in one of my starters and sealed the bucket and inserted an airlock in the lid. It was bubbling vigorously by the morning. 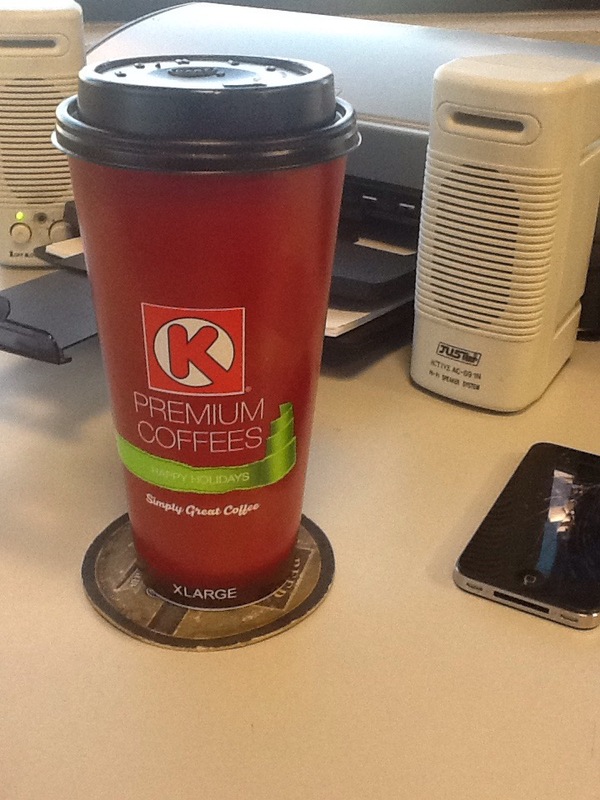 Circle K. Still my fave coffee.